For the ultimate, adrenaline packed event Xtreme Combat is the perfect choice! Our tactical combat events are highly competitive, yet incredible fun – everyone can join in! 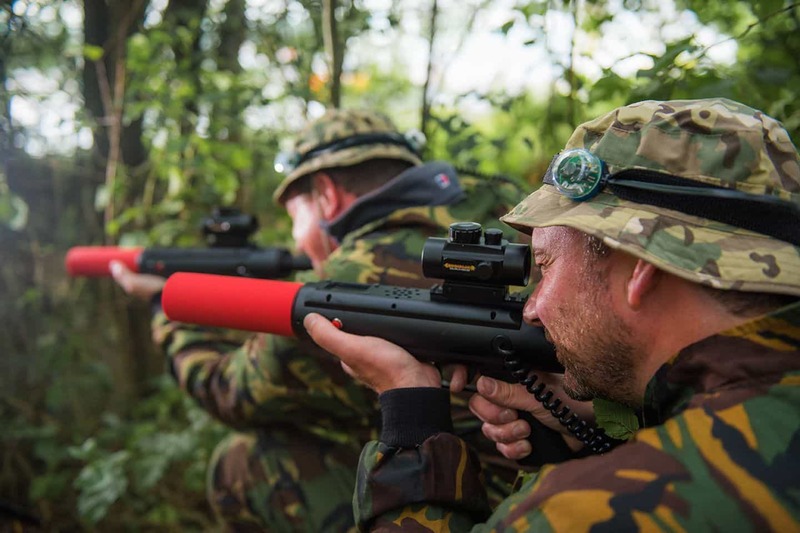 Groups are split into two opposing teams, and experience 6 missions in our 5 acre woodland combat zone using our state of the art weapons that fire infra red beams, it doesn’t hurt and you don’t need to worry about paying for ammo! Our Age 14+ events are much more tactical in nature, and play very differently to the younger events. Please note that for exclusive event options you will play exclusively within your group, however other groups may be onsite playing separately on another game zone. Please contact us on 01324 579797 to discuss timeslots available! Whether you play war game simulations every night, spent a childhood crawling through woods playing with guns, or have never even held a gun, we can provide a combat simulation experience to remember! Since the guns only fire harmless infra red beams, its painless for the players, and there is no additional ammo to purchase so it is fantastic value for money! After a full briefing, players will head out into the arena for up to 6 team battle missions, all designed to ensure team play, fun and adrenaline packed action (events will last approx 1.5 hours)! All equipment (MP5 weapon, head sensors and camouflage hat) are provided, we only ask that you come prepared to have fun, wearing sensible shoes (eg trainers/boots) and dressed appropriately for the weather conditions and woodland arena. We can also provide Multi Acitvity Packages including Karting at a discounted rate. Call us for further details and a quote.